There’s a real science behind the work we do in behavioural change. A science that has been around for decades in physics and biology. A science that most of those working in traditional behavioural psychology hasn’t discovered yet. That’s not a criticism. If someone didn’t know something different you can’t blame them. For example, did you know your eyes actually see everything upside down? And then the brain processes the image, converts it upright, filters and processes it based on what your mind thinks is relevant, and believes and has experienced. David Bohm called this ‘prejudice’ in a very pure sense: un-noticed biases. No two people will ever see the same ‘reality’. Everyone lives in a separate reality. And we all have freewill. So, someone else will never ever see it your way! By the way, the brain and the mind are not the same. One is a biological processing unit, the other is energy, or life force or God or spirit or whatever the word is you like to use. They only different words for the same thing. You can pick up effects in the brain, through scans, and chemicals and neurotransmitters. But all you’re doing is picking up biological effects, not causes. It’s fascinating, but only one half of the picture. Or even what’s going on to create the picture you “see”. And here’s a test: when you switch off the energy to the brain, what happens? We’re all born happy and fully equipped to navigate our way in life. However, over time, we’re conditioned, taught or even told by others to think that our thinking and feelings come from objects, circumstance or how other people treat us. The effect of that is when those objects, circumstances or other people change, or are taken away we feel lost and a victim of those changes. 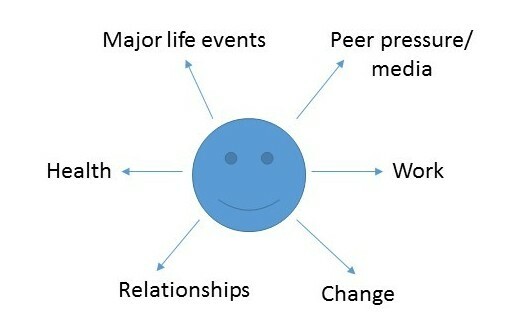 It appears – and we are told – that our experience of life comes from a bunch of sources, as the diagram shows. So if we take something like stress, we are told the causes are from other people, work, health, major life changes like divorce. It looks like all these things outside of us are creating our experience. And it looks like the best option is to ‘cope’ with these. After all, how do you control a cause if it is outside you? Well, it’ll probably come as a big surprise to you that there is actually no causal evidence for this whatsoever! There never has been. In decades of research in to the causes of stress, there has never been any causal evidence found. (Causal evidence is something like gravity. It works and has the same results whether you believe in it or not). What that has been is some interesting correlational evidence. But it’s possible to correlate any two things together, and assume a relationship between them. And the “link” can seem compelling. Except when the opposite is true. So whilst it seems for some people work is a “source” of stress, for others, it’s not. And for others sometimes it is and sometimes isn’t. Hmmm!?!! What’s going on then? And for some, they experience “work stress” even when they are not at work, say on holiday! In psychology, that’s actually the definition of a phobia, not stress (A phobia is thinking about something and having a reaction, without the stimulus being present e.g. just imagining a spider brings on the feelings of discomfort). And you don’t need to take my word for it. 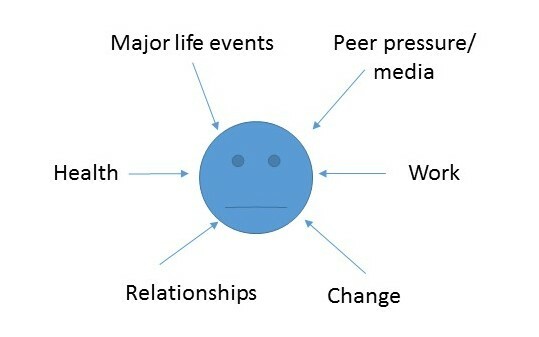 A UK Government sponsored report back in 2008 titled “5 Ways to Well-being” couldn’t find any causal evidence either into the causes of well-being, and it looked at a lot of evidence! It did find some interesting correlations, but couldn’t find any cause. And correlation is not cause. It seems we’ve all been mis-sold the cause of our experience! Fortunately, science has found the answer to where our experience – our thoughts and feelings – actually come from, and it appears it’s a bit of an inside job! And again, you don’t have to take my word for it. Here’s the diagram the right way round, as explained by the likes of physicist David Bohm (who worked with Einstein) and Evolutionary Biologist Donald Hoffman. And there’s a body of real evidence behind it. And it seems that experiencing a subjective reality is a good thing that keeps us alive! It seems that thoughts and feelings are mind-made illusions. That is to say they are real – or we experience them as real – but they are illusions created by us, a perception, created at the moment of observation as physics calls it. But because they happen so quickly, we don’t notice this, and put the blame or meaning on to something outside of us. It’s like being wowed by a magic trick. We know it’s a magic trick, but still get caught up in the illusion. The moment you realise that you are the magician of your own thinking and feelings the magic trick wears off. It’s why tools and techniques don’t consistently work as you’re trying to fool yourself! Which is why we don’t teach those at Headstuff™. We teach you how you and everyone actually works, and keep pointing you in that direction. And it’s a total game changer. Particularly if you work in the realm of public policy, employee engagement, productivity, change management, or any intractable problem come to it. For example, just this understanding coming through in to how you work with people can switch from say 80% employee disengagement to 80%+ employee engagement. Most people who hear this for the first time usually get defensive and argumentative – they’ve only heard it as a concept. Some get curious. And a few go oh yes, that makes sense, and it makes a real difference in their lives and how they approach situations. The latter who have heard it insightfully rather than as a concept. I once asked my younger brother who is a pioneer in climatology research why aren’t the normal scientific principles of looking for cause and effect are used in behavioural research? He said, it’s because people are complex. And he works in very complex systems of weather and yet looking for a simple explanation of what’s behind it all. Humans are no different. True, they are complex biological functioning units. True, they operate in complex environments. But it’s not the environment that causes their behaviour. For that to be true, everyone would have the same reaction to the same environment. And that’s clearly not the case. It seems that humans too actually operate under very simple principles. Have you ever heard phrase the answer lies within? Well, it turns out be true. Scientifically true!